The red planet would not be an easy place to thrive, but perhaps somewhere below the surface, sheltered from the harsh radiation of the surface, with a few drops of water to drink, life could get by.There are traces of methane in Mars' atmosphere. Its most likely source is either geochemical or biological either it comes from the breakdown of minerals, or from the farts of tiny microbial Martian organisms. 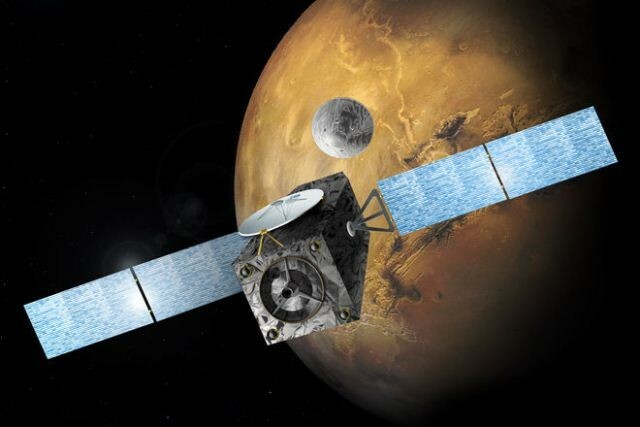 To help us find out, Europe's ExoMars orbiter is scheduled to launch in the early morning of March 14 from Kazakhstan. When it gets to Mars in October, the Trace Gas Orbiter will map the methane around Mars in hopes of finding its source. The maps will help determine the landing site of a rover, coming in 2018, that can investigate further. The orbiter will also release a lander, named Schiaparelli, after the Italian astronomer who drew maps of Mars in the late 1800s. The lander will function for only a few days, studying Mars' global dust storm (sort of like the one in The Martian, but less intense and more realistic). The lander's main function is to test out a new landing system that's designed for a future mission, to land a more functional Mars rover in 2021. That rover will carry a drill and a laboratory to search for the signatures of life, both past and present. It's slated to launch in 2018.